This features a 20% linen and 80% cotton blend. 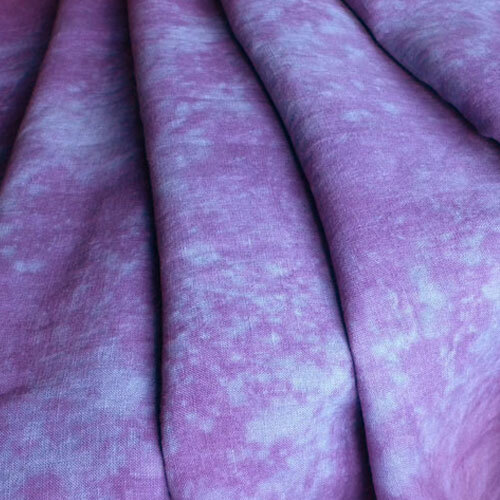 Colours are similar to Bombay Sky: pink and purple with some white/ecru flecks. I have found a reference about Bombay Star being available in July 2013, but haven’t found much else. 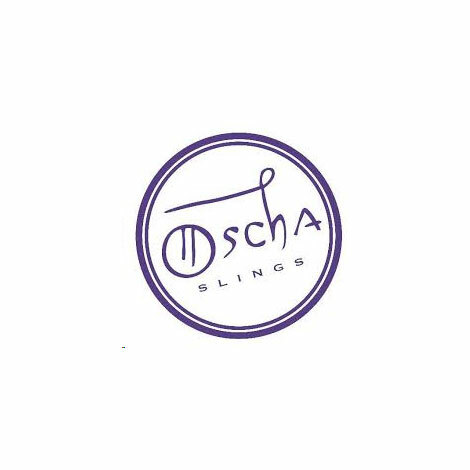 Oscha has art dyed wraps on fine English and Irish linen. They also have a linen/cotton blend (20% linen) as well as 100% cotton diamond weave. They are all lovingly hand dyed by Vicki Masters aka ‘Nana Oscha’, which makes every wrap and ring sling unique. 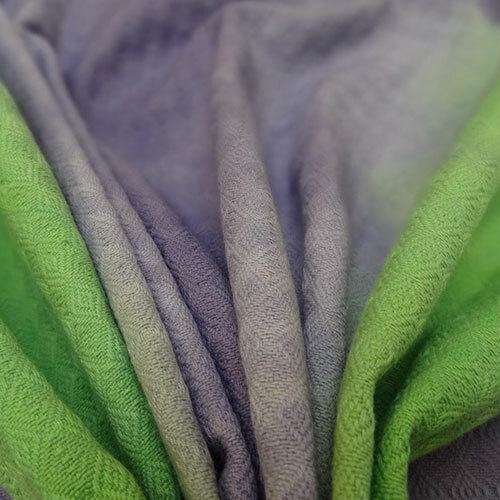 “The linen for our dyed wraps is finely spun, light and breathable, making it a good choice for warmer climates. 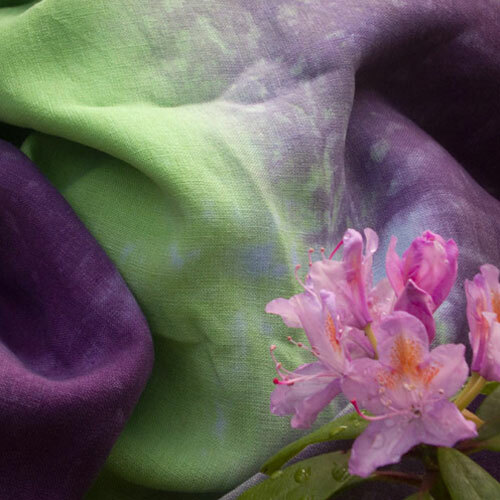 This high-quality fabric is then hand dyed to create beautiful, elegant and vibrant gradations. A truly stunning sling. We use plain white and natural English linen to create subtly different effects from each colourway. The white linen is lighter and somewhat finer than the natural, which is a little more dense. Each creates a slightly different but equally supportive sling. 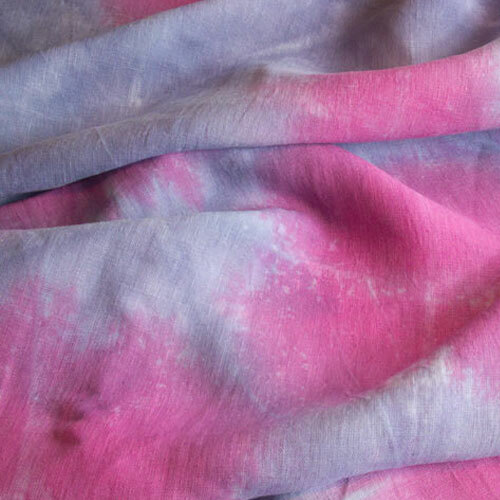 When dyeing 100% linen, and more so when using certain colours, the dye moves into or away from the linen’s natural creases and sometimes creates thin, faded or more deeply coloured lines across it. Sometimes we seek to make a feature of this, often they are just a subtle part of the overall effect, which works well with the natural qualities of the linen and is part of the charm of a hand dyed sling. Although we strive to make each sling to the highest quality, there may be occasional irregularities that are part and parcel of a non-mechanised process. Because our slings are hand dyed there will be some variation and each is essentially unique, colours may turn out to be slightly different to the images here. All of the dyes used in our gradations are non-toxic and free of heavy metals and other pollutants. Note: Irish linen used to be used for the dyed grads. While Oscha may be most famous for its jacquard patterns, art dyed slings have always been a part of the in stock items on the website. They are very nice for warm (or even hot!) summers, keeping you cool like no other fabric will. Read more about the dye process on Oscha’s blog. Mumbai (also known as Bombay, the official name until 1995) is the capital city of the Indian state of Maharashtra. It is the most populous city in India and the ninth most populous agglomeration in the world. Mumbai has an estimated city population of 18.4 million. Source: Wikipedia.